Debt is something we all have to deal at some point in our lives. But when things start to spiral out of control, being in debt becomes even more scary. There are no quick fixes, but you need to take control quickly - here’s how! Sometimes, if you have a lot of debts that are proving difficult to handle, it can be beneficial for some people to consolidate their debts into one more manageable package. The main benefit of this is that it takes the chaos and uncertainty out of your debt. You’ll no longer have to worry about multiple deadlines and interest rates, as you’ll have it rolled into one monthly payment. Visit debtconsolidationusa.com to find out more about how debt consolidation could make life easier for you. It’s not a decision you should take lightly though. Make sure you weigh up the pros of cons before coming to a conclusion. Your interest rate would have been set when you first took out your credit cards. So, if your credit rating has improved since the time you first got your credit card, you might be able to get a better rate. If you’re not sure about if this applies to you, contact your card provider, it’s always worth asking! 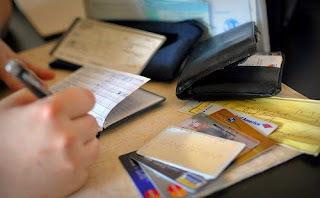 If your debts are very bad though, it might not be a good idea to carry on using credit cards at all. Spiralling debts aren’t helped by using credit cards. So, think carefully about whether you should carry on using them, for a lot of people, cutting them up might be the more sensible option. The best way to clear your debts quickly is to cut down on your monthly spending. This will make sure that you don’t pile on any further debt. And then, with the money you save by cutting down, you can start to pay off your debts a little bit quicker. It’s not an easy solution, but it’s worth it. To cut down, you’ll need to draw up a monthly budget. And once the budget is in place, don’t break it, no matter how tempted you are. There’s no point making a budget if you’re going to easily break it. If you stick to your budget, your debts will start to fall a bit quicker. You should make sure you have a clear vision of where your finances are heading. This helps in many ways. Firstly, it makes sure you’re on top of your finances, and you don’t end up missing payment deadlines because that could ruin your credit rating. Paying your debts off on time is essential if you’re ever going to become debt free. The other big benefit of getting your finances and debts in order is that it allows you to see how long it will currently take you to pay off all your debts. This might seem unimportant to you, but having something to aim for when you’re looking to clear your debts can be a real advantage. Dealing with debt is difficult enough without losing control of the situation, so get control and use these tips!